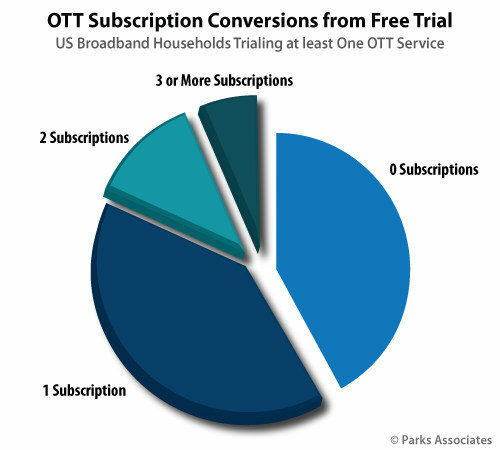 DALLAS — New research from Parks Associates finds 58% of US broadband households who trial an OTT video subscription service convert to paying subscribers. The firm will present its OTT research at the upcoming NAB Show in Las Vegas, including highlights from ‘OTT Video Services: Purchasing and Perceived Value’, which reports that the conversion rate from free trial to paying subscriber is higher among consumers who trial multiple services. Sappington will participate at the Streaming Summit during the NAB Show, where he will join other OTT experts to address the trends in streaming services and the video market, including the impact of Apple’s recent announcements regarding the company’s Apple TV+ streaming service and the Apple TV app. The panel will take place on April 9 at 1:30 PM in Room N251 (North Hall). ‘OTT Video Services: Purchasing and Perceived Value’ examines current perceptions, adoption, and use among consumers for SVOD, AVOD, and TVOD OTT video services, including average amount spent, number of services taken per household, drivers of adoption, and OTT service churn.